As a fiber artist I'm lucky to get to spend a good part of the summer in Maine where there is a very active community of fiber artists and producers - over 134 fiber studios, farms, shops and learning centers, are listed on the Maine Fiberarts Tour Map. 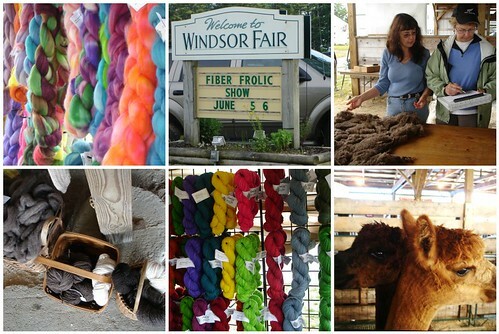 In June of each year the Fiber Frolic is held at the Windsor Fair grounds ... somewhat in the style of a traditional agricultural fair (minus the midway). Rain or shine individuals involved in any aspect of fiber art turn out along with alpacas, sheep, goats and bunnies to sell, learn, demonstrate and in some instances compete. This year featured a sheep to shawl demonstration, and Make it in Maine with Fiber contest, hands-on workshops and limboing lamas. Vendors sold tools, fiber products and handmade goods (along with THE BEST FALAFEL ever!) Several years ago I was so taken with some (very expensive) yarn that I bought it even thought I DON'T (didn't) KNIT. In September Fiber College takes place in Midcoast Maine -- back to back and overlapping workshops, demonstrations and guest artists all on the shores of the Penobscot Bay and outdoors, weather permitting. It's like camp for grown ups in the best way possible. In between there is a weekend in August when all of the sites on the aforementioned map are open to the public.